Power punch striker Conor Mcgregor is one of the best athletes in the world and people were so desperate to see him throw down inside the Octagon after two years of hiatus at UFC 229 against Khabib Nurmagomedov. Unfortunately, he falls short in his grudge match as Nurmagomedov submitted him in the fourth round by neck crank. Then Khabib Jumped over the Octagon fence and attacked Mcgregor’s cornerman, and coach Dillon Danis after the Bellator’s welterweight grappler taunted him from cage-side, then all hell loose broke. I guess no one knew who Danis was thanks to post-fight brawl at UFC 229. During the melee, brash Irishman assaulted by at least one member of Khabib’s team who rushed into the Octagon after referee Herb Dean stopped the action. After the bitter loss and violent end to the event, Conor McGregor reportedly skips an after fight party, but Danis was not planned to call it a night as the Brazilian Jiu-Jitsu black belt was seen alone at a nightclub in the Las Vegas by rising UFC featherweight contender Brian Ortega. “First I was like, ‘Damn, what are you doing here – especially alone? I was like, ‘This guy is a savage here,’” said Ortega during a conversation with TMZ Sports (via MMA Junkie). “He was respectful. He said, ‘Hey man, you’re holding it down for the jiu-jitsu community. I admire you. I appreciate it.’ He was cool about the whole situation,” he added. 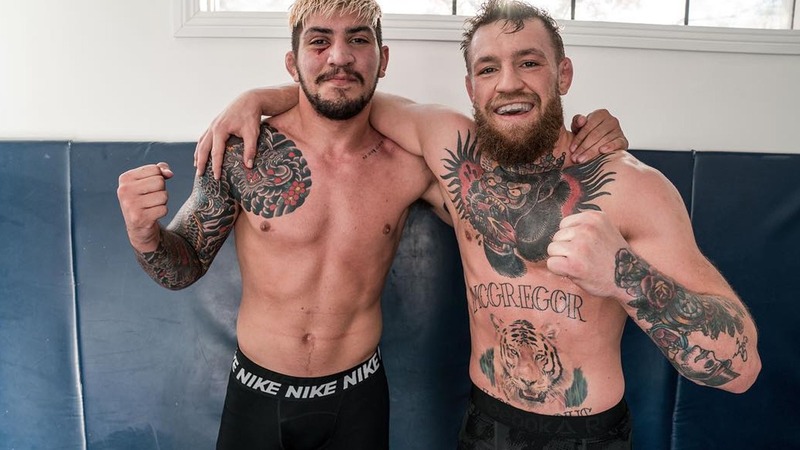 Danis who has been a training partner with McGregor ever since the Notorious’s submission loss to Nate Diaz back in March 2016 and has following McGregor’s trash-talking tendencies over the past two years. After closely seeing the post-fight brawl video, it shows Danis was hit twice from the back by one of Khabib’s teammate, which may have caused an injury. In another angle, McGregor punches the first fighter who rush inside the octagon to him, then got hit from behind as well. Although Irishman didn’t cause chaos, he still has to answer NSAC for his role in post-fight melee, as well as Khabib and his teammates.